Learn how to achieve a relaxed and focused state. Everyone gets anxious from time to time: there’s public speaking, job interviews, the dentist and all the rest. For about one in six of us this will cross over into what psychologists term a disorder at some point in our lives. This is when people are almost continuously anxious and find it difficult to concentrate, have trouble sleeping and become irritable and restless. Women are roughly twice as likely as men to suffer from an anxiety disorder. For the rest of us anxiety will come and go as part of the normal human condition. Whether it’s a constant or occasional affliction, dealing with anxiety effectively is important. People are often prescribed drugs for anxiety but these are less effective in the long-term and have side-effects so relaxation training is often preferred. The most commonly studied type of relaxation therapy may be familiar to you. It involves mentally going around the muscle groups in your body, first tensing then relaxing each one. It’s as simple as that. And with practice it becomes easier to spot when you are becoming anxious and muscles are becoming tense as, oddly, people often don’t notice the first physical signs of anxiety. This is based on the idea that the mind follows body. When you relax your body, the mind also clears. Applied relaxation builds on progressive relaxation. First you learn to relax you muscle groups one after the other. The next stage is to cut out the tensing phase and move straight to relaxing each muscle. Next you learn to associate a certain cue, say thinking ‘serenity now!’ (hello Seinfeld fans!) with a relaxed state. You then learn to relax really quickly. Finally you practise your relaxation technique in real-world anxiety-provoking situations. Once again, mostly this is about mind following the body. Goes back to the 1930s and is another technique for progressively relaxing the muscles. To help you do this it has a mantra which you repeat to yourself as you go around major muscle groups: “my right arm is very heavy” and so on. A second stage involves inducing a feeling of warmth in the muscles. Once they feel ‘heavy’ from the first stage, you follow another mantra about warmth: “my right arm is very warm” and so on. Further stages involve calming the heart and the abdomen and cooling the brow in much the same way. Once again, you’ll notice that this is all about the mind following a calm body. As before practitioners recommend daily practice so that you can relax more and more quickly. With practice the simple intention to start the training will be enough to cause the body to become relaxed and warm. Here’s our old friend meditation which has so many different benefits. If you’ve been reading PsyBlog for a while you’ll have seen this come up in numerous contexts. There is certainly evidence that it can work for people who experience anxiety as well. 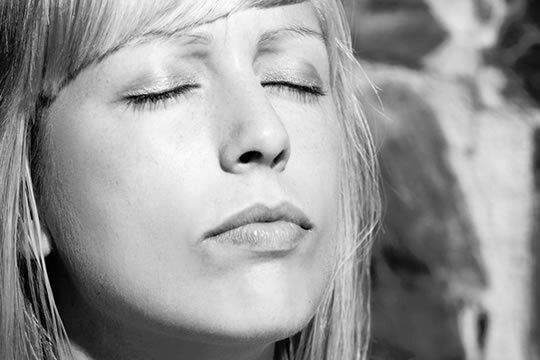 I describe the basics of mindfulness meditation in this article about attention and meditation. Be aware that meditation is quite difficult and the drop-out rates are high from studies which investigate it (Krisanaprakornkit et al., 2009). This suggests some people don’t find it particularly acceptable. For people who can manage it, though, the results are often better than the other techniques (Manzoni et al., 2005). Notice that this technique is much more actively related to the mind than the first three methods. It doesn’t just target the body and wait for the mind to follow, instead it’s about the way attention is focused. This may be partly why people find it harder. Still, it probably won’t do any harm to try. Finally cognitive behaviour therapy, or CBT, targets both mind and body. As it’s primarily a talking therapy you normally have to go to a psychologist who will help you target unhelpful thinking patterns. But there are books available that explain how it works (I mention a few here: 6 Self-Help Books for Depression Recommended by Experts). However these don’t specifically target anxiety, they’re mostly for mild depression. And there’s no reason why you should stick to only one approach. When Manzoni et al. looked at studies which used multi-modal techniques, they found these were effective as well. If you need to relax—for whatever reason and at whatever time—then try one or more of these different methods. As you’ll have noticed the effective techniques share a lot in common. Regular practice is the key and, if you give it a chance, the mind really will follow the body.